Country: United States | Fonts used: Smart Sans. 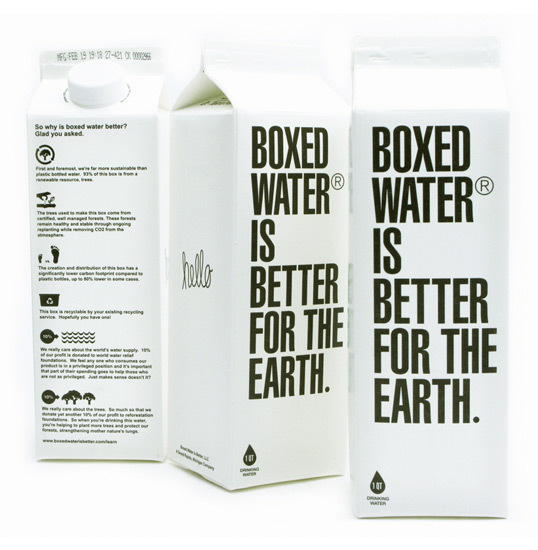 Kevin Hockin from Boxed Water sent us some photos of their newly launched product. With a package that is more sustainable than plastic bottles, they’ll be giving away 20% of all profits. 10% to world water relief and 10% to reforestation foundations. “Started with the simple idea of creating a new bottled water brand that is kinder to the environment and gives back a bit – we found that it shouldn’t be bottled at all, but instead, boxed. So we looked to the past for inspiration in the century old beverage container and decided to keep things simple, sustainable, and beautiful. Dang. Thought of this a few months ago. Too late! @ akrokdesign Tap water is the WORST for the humans. Sorry to the person who replied to Wayne’s comment about tap water. Somehow it got deleted as it was being approved. We apologize for the inconvenience. considering most bottled/boxed water is just tap water, i don’t see what your problem with tap water is. of course, it depends on where you are and how clean the water is, but you can’t just say all tap water is bad for people. that’s ridiculous. Such a gimmick. It’s exactly the same as plastic. Another product that requires energy to make and recycle (providing your community has the means and commitment/breakdown. Who falls for this. I don’t know if you could say it’s a gimmick, at least not totally. 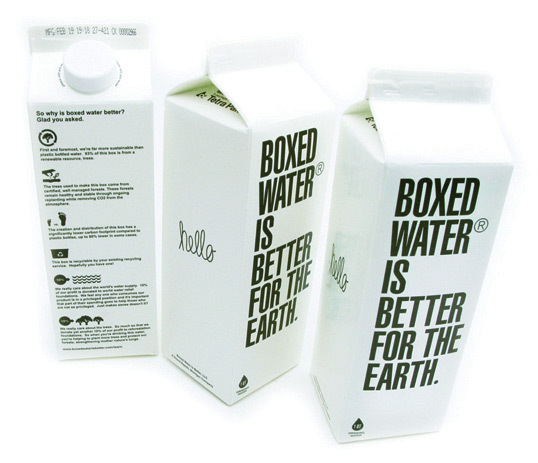 It’s true that bottled/boxed water is quite silly. In our country, pretty much all of us have at least two, or three, or four, or more clean water supplies in our homes. It would of course be better if we all carried Sig bottles around with us and never bought prepackaged water ever. but the truth is that people are going to do it, so why not do it responsibly. I say cheers to them! Plus I know the guys and they’re frigging cool and not out to make a buck. If you have access to clean tap water than that’s the best option. If you have tap water but don’t like the taste or worry that it’s clean, get a UV filtered bottleless water cooler and filter your tap water. If you don’t have access to tap water then this might be a better alternative to bottled water if in fact the box is better for the environment than plastic bottles. im looking to package my own water in south africa. your idea is great!! how can i use your packaging? do i import your empty boxes and fill them for resale here? please could you respond with any details..
can I buy it in China ? Can someone explain to me how and where I can carry this big F*ing box of water around? It doesn’t serve any purpose. It doesn’t solve any true and real life problems. The idea is as bad as the square wheel. I’ll give you an idea. Create a water dispenser machine with purified water. And let people refill their bottle for a small fee. You cut amount bottles that go to the landfill, reduce pollution, and save trees.